Mysterious island, horrifying monster, cry for help, brave heroes coming to the rescue… It looks like the beginning of a standard and unremarkable adventure story… However, while going deeper into the plot of the science fiction novel “The Monster: Blade of Darkness”, the reader increasingly understands that each subsequent event, as well as the final outcome, could not have been predictable. This is due to the fact that the author reveals the plot bit by bit, allowing the reader to gradually string them on the narrative thread. The novel is unusual not only due to its plot, but also because of the interweaving of different genres within it. Like an exotic culinary dish, it is layered in fantastic adventures with scientific facts and discussions, spiced with a tender romantic story, and sweetened with a pinch of humor and irony. And this dish will be further enjoyed accompanied by the author’s philosophical discussions on the interrelations between Nature and Man in today’s world, as well as in the near future. Travelling to a mysterious island in the middle of the ocean, trip to the jungle full of life, meeting the local tribe of Sololeadas, investigating of disappearance and death of people on the island, hunting an enigmatic dinosaur-like animal, experiencing romantic adventures and last but not least discussing about the Nature and its interrelations with mankind – all this awaits you in the first novel of “The Monster” trilogy by Alexandr Iscenco entitled “The Monster: Blade of Darkness”. Official website of the novel: www.themonster.info. To me your novel turned out to be a long-awaited and refreshing drop of dew for my brain. Alexandr Iscenco was born on the 9th of May, 1985 in Chisinau, the capital of the Republic of Moldova. Since childhood he has been interested in astronomy, anatomy of animals and humans, entomology, genetics and ecology. Alexandr did his studies at the Free International University of Moldova (www.ulim.md) and the University of Copenhagen (www.ku.dk) in the field of Environmental and Natural Resource Economics. He also participated in a number of educational programs on the topics of environmental protection, leadership and entrepreneurship at universities in Denmark, Estonia, Latvia, Lithuania, Hungary, Australia and the USA. Alexandr began his literary activity in 2003. Back then his first tentative poems, poetic translations and the first large and interactive novel “The Scorpion” appeared. Alexandr’s first book was published in 2007. It was a small collection of works entitled “The Thoughts: the World of My Heart and Soul. The Favorites”, which included several dozens of poems, five poetic translations and two short stories, “The Black Hole” and “Road to Happiness”. Also several poetry works were published in the anthology “The Golden Verse” in 2009. The rest of the poems were posted by the author on his literary blog “The Thoughts” (www.ischenco-thoughts.blogspot.com). 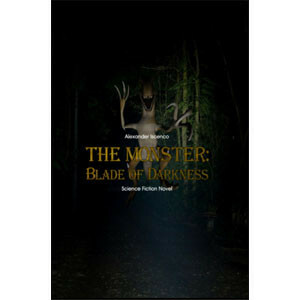 Alexandr began working on the novel “The Monster: Blade of Darkness” in 2000. In 2010 the first draft of the literary work was completed. In 2013 the revision and editing of the text of the novel were finished. And only in 2014 the novel was published. This was possible due to the great support of the author's parents, Vera and Victor Iscenco, whom Alexandr is immensely grateful to.